PITTSBURGH – The first round of 2019 NCAA wrestling championships at PPG Paints Arena is in the books. Below are the first round results and pigtail round results. Sebastian Rivera, northwestern tf. Trey Chalifoux, Army, 21-6 4:00. Drew Mattin, Michigan Dec. Devin Schroder, Purdue, 5-3. RayVon Foley, Michigan State tf. Rico Montoya, Northern Colorado, 15-0 6:24. Vitali Arujau, Cornell md. Malik Heinselman, Ohio State, 12-2. Jack Mueller, Virginia pin. Gage Curry, American, 1:27. Drew Hildebrandt, dec. Gabe Townsell, Stanford, 6-0. Ronnie Bresser, Oregon State Pin. Christian Moody, Oklahoma, 2:59. Spencer Lee, Iowa tf. Bryce West, Northern Illinois, 18-0 6:27. Sean Fausz, N.C. State Dec. Alex Mackall, Iowa State, 8-2. Travis Piotrowski, Illinois Dec. Cole Verner, Wyoming, 4-3. Sean Russell, Minnesota md. Dack Punke, Missouri, 16-6. Pat Glory, Princeton tf. Alonzo Allen, Chattanooga, 16-0 3:16. Brent Fleetwood, North Dakota State Dec. Carmen Ferrante, Penn, 2-0. Elijah Oliver, Indiana Dec. Zeke Moisey, Nebraska, 11-4. Nicholas Piccininni, Oklahoma State Pin. Korbin Meink, Campbell, 1:42. Daton Fix, Oklahoma State MD. Zack Trampe, Binghamton, 21-7. Matthew Schmitt, West Virginia md. Sean Nickell, CSU Bakersfield, 9-1. DJ Fehlman, Lock Haven Dec. Charles Tucker, Cornell, 7-2. John Erneste, Missouri md. Derek Spann, Buffalo, 8-0. Luke Pletcher, Ohio State MD Tim Rooney, Kent State, 12-3. Montorie Bridges, Wyoming Dec. Cam Sykora, North Dakota State, 3-2. Austin Gomez, Iowa State md. Brandon Paetzell, Lehigh, 11-0. Micky Phillippi, Pittsburgh Dec. Gary Joint, Fresno State, 4-2. Nick Suriano, Rutgers MD. Dylan Duncan, Illinois, 12-3. Korbin Myers, Virginia Tech md. Josh Terao, American, 11-3. Tariq Wilson, N.C. Dec. Noah Gonser, Campbell, 5-0. Ethan Lizak, Minnesota Dec. Anthony Cefolo, Rider, 3-1. Austin DeSanto, Iowa dq. Codi Russell, Appalachian State. Roman Bravo-Young, Penn State Dec. Mario Guillen, Ohio, 8-2. Ben Thornton, Purdue Dec. Gary Wayne Harding, North Carolina, 12-10 SV. Stevan Micic, Michigan md. Mason Pengilly, Stanford, 15-7. Yianni Diakomihalis, Cornell Dec. Peter Lipari, Rutgers, 10-5. Chad Red, Nebraska pin. Ian Parker, Iowa State, 3:59. Dom Demas, Oklahoma md. Mitch Moore, Virginia Tech, 11-3. Kanen Storr, Michigan Dec. Josh Finesilver, Duke, 10-7. Jaydin Eierman, Missouri pin. Chris Debien, Chattanooga, 4:41. Cameron Kelly, Ohio Dec. Austin Headlee, North Carolina, 6-4. Kyle Shoop, Lock Haven Dec. Matt Findlay, Utah Valley, 8-7. Josh Alber, Northern Iowa Dec. Corey Shie, Army, 10-3. Nick Lee, Penn State pin. Nate Limmex, Purdue, 3:38. Derian Perry, Old Dominion Dec. Jamel Morris, N.C. State, 5-1. Max Murin, Iowa Dec. Tristan Moran, Wisconsin, 3-2. Michael Carr, Illinois Dec. Anthony Sparacio, Binghamton, 8-2. Mitch McKee, Minnesota pin. Sam Krivus, Virginia, 5:00. Sam Turner, Wyoming Dec. Nicholas Gil, Navy, 4-2. Kaid Brock, Oklahoma State MD. Bryan Lantry, Buffalo, 12-3. Joey McKenna, Ohio State tf. Grant Willits, Oregon State, 5-20 pm. Anthony Ashnault, Rutgers md. Malik Amine, Michigan, 10-2. Davion Jeffries, Oklahoma Dec. Christian Monserrat, West Virginia, 2-1. Justin Oliver, NC State Dec. Cortlandt Schuyler, Lehigh, 10-6. Jarrett Degen, Iowa State md. Russell Rohlfing, CSU Bakersfield, 14-3. Matthew Kolodzik, Princeton Dec. Michael Sprague, American, 3-2. Brady Berge, Penn State Dec. Khristian Olivas, Fresno State, 6-3. Thomas Thorn, Minnesota Dec. Anthony Artalona, ​​Penn, 5-4. Brock Mauller, Missouri. Matthew Zovistoski, Appalachian State, 10-2. Mitch Fine silver, Duke tf. Parker Kropman, Drexel, 17-1. 6:35. Cole Martin, Wisconsin Dec. Requir van der Merwe, Stanford, 8-6 SV. Joshua Heil, Campbell pin. Henry Pohlmeyer, South Dakota State, 4:59. Austin & # 39; Connor, North Carolina Dec. Tejon Anthony, George Mason, 3-1. Ryan Blees, Virginia Tech Dec. Kaden Gfeller, Oklahoma State, 5-1 SV. Pat Lugo, Iowa Dec. Joshua Maruca, Arizona State, 5-2. Max Thomsen, Northern Iowa Dec. Jared Prince, Navy, 9-8. Micah Jordan, Ohio State pin. Shayne Oster, Northwestern, 3:37. Jason Nolf, Penn State Pin. Ben Anderson, Duke, 0:43. John Van Brill, Rutgers m. BC LaPrade, Virginia Tech, 10-2. Christian Pagdilao, Arizona State MD. Joshua McClure, North Carolina, 12-2. Josh Humphreys, Lehigh Dec. Justin Ruffin, SIU Edwardsville, 6-0. Hayden Hidlay, N.C. State tf. Hunter Willits, Oregon State, 16-1 7:00. Justin Thomas, Oklahoma Dec. Taleb Rahmani, Pittsburgh, 7-1. Luke Weiland, army dec. Jarrett Jacques, Missouri, 4-0. Alec Pantaleo, Michigan md. Alex Smythe, Buffalo, 16-3. Ryan Deakin, Northwestern Dec. Christian Labrie, Brown, 7-4. Griffin Parriott, Purdue Dec. Zach Hartman, Bucknell, 7-4. Ke-Shawn Hayes, Ohio State Dec. Zac Carson, Ohio, 7-1. Caleb Young, Iowa tf. Dan Reed, Columbia, 16-1 3:47. Larry Early, Old Dominion md. Quincy Monday, Princeton, 10-0. Steve Bleise, Minnesota md. Chase Straw, Iowa State, 9-1. Eric Barone, Illinois Dec. Logan Parks, Central Michigan, 5-3. Alex Marinelli, Iowa Dec. Joseph Smith, Oklahoma State, 7-4. Thomas Bullard, N.C. State Dec. Jonathan Viruet, Brown. 3-2. Cael McCormick, Army pin. Demetrius Romero, Utah Valley, 2:28. Mekhi Lewis, Virginia Tech pin. Cam Coy, Virginia, 6:49. Chance Marsteller, Lock Haven md. Carson Brolsma, Minnesota, 16-3. Shan Campbell, Ohio State Dec. Ebed Jarrell, Drexel, 6-0. Andrew Fogarty, North Dakota State tf. Tyler Marinelli, Gardner-Webb, 17-2. 7:00. Evan Wick, Wisconsin md. Nick Kiussis, West Virginia, 10-2. Joshua Shields, Arizona State MD. Colston DiBlasi, George Mason, 14-4. Jesse Dellavecchia, Rider Dec. Tanner Skidgel, Navy, 9-2. Bryce Steiert, Northern Iowa Pin. Bryce Martin, Indiana, 2:35. Logan Massa, Michigan md. Troy Keller, Buffalo, 15-3. Isaiah White, Nebraska Dec. Joseph Gunther, Illinois, 5-1. Branson Ashworth, Wyoming md. Zach Fine Silver, Duke, 9-1. Connor Flynn, Missouri Dec. Gordon Wolf, Lehigh, 5-4. Vincenzo Joseph, Penn State Pin. Evan Delong, Clarion, 2:58. Mark Hall, Penn State MD. Devin Kane, North Carolina, 10-2. Brandon Womack, Cornell Dec. Neal Richards, VMI, 11-10 TB1. Devin Skatzka, Minnesota md. Lorenzo De La Riva, North Dakota State, 15-3. Taylor Lujan, Northern Iowa md. Hayden Hastings, Wyoming, 15-7. Jordan Kutler, Lehigh md. Jacob Oliver, Edinboro, 10-2. Matt Finesilver, Duke Dec. Marcus Coleman, Iowa State, 8-2. Spencer Carey, Navy Dec. Brit Wilson, Northern Illinois, 10-5. Myles Amine, Michigan Dec. Joe Grello, Rutgers, 8-3. Zahid Valencia, Arizona State MD. Dean Sherry, Rider, 11-2. Kimball Bastian, Utah Valley Dec. Ethan Smith, Ohio State, 6-4 TB1. Ben Harvey, Army Dec. Dylan Lydy, Purdue, 8-3. David McFadden, Virginia Tech Dec. Vincent Deprez, Binghamton, 4-0. Jacobe Smith, Oklahoma State Dec. Drew Hughes, Michigan State 6-4 EN. Mikey Labriola, Nebraska Dec. Daniel Bullard, N.C. State, 7-5. Ryan Christensen, Wisconsin Dec. Andrew Morgan, Campbell, 4-0. Daniel Lewis, Missouri pin. Travis Stefanik, Princeton, 1:13. Myles Martin, Ohio State pin. Bob Coleman, Oregon State, 3:22. Corey Hazel, Lock Haven Dec. Andrew McNally, Kent State, 9-3. Taylor Venz, Nebraska Dec. Tanner Harvey, American, 7-4. Ryan Preisch, Lehigh pin. Max Lyon, Purdue, 4: 4. Maxwell Dean, Cornell MD. Noah Stewart, Army, 13-2. Cash Wilcke, Iowa Dec. Nick Gravina, Rutgers, 3-2. Nino Bonaccorsi, Pittsburgh Dec. Will Sumner, Utah Valley, 11-4. Emery Parker, Illinois Dec. Will Schany, Virginia, 5-2. Zachary Zavatsky, Virginia Tech Dec. Dom Ducharme, CSU Bakersfield, 8-2. Cameron Caffey, Michigan State Dec. Dylan Wisman, Missouri, 7-5. Lou Deprez, Binghamton md. Mason Reinhardt, Wisconsin, 11-2. Drew Foster, Northern Iowa md. Christian LaFragola, Brown, 10-0. Dakota Geer, Oklahoma State Dec. Nick Reenan, N.C. State, 6-0. Samuel Colbray, Iowa State Dec. Jackson Hemauer, Fresno State, 8-2. Chip Ness, North Carolina Dec. Tate Samuelson, Wyoming, 8-2. Shakur Rasheed, Penn State MD. Kevin Parker, Princeton, 11-2. Bo Nickal, Penn State pin. Ethan Laird, Rider, 2:35. Josh Hokit, Fresno State Dec. Stephen Loiseau, Drexel, 5-1. Jake Jakobsen, Lehigh Dec. Benjamin Honis, Cornell, 8-5. Nathan Traxler, Stanford Dec. Greg Bulsak, Clarion, 7-3. Jacob Warner, Iowa Dec. Drew Phipps, Bucknell, 9-8. Thomas Lane, Cal Poly Dec. Rocco Caywood, Army, 8-3. Malik McDonald, N.C. State Dec. Noah Adams, West Virginia, 8-3. Patrick Brucki, Princeton Dec. Brandon Whitman, North Carolina, 8-2. Preston Weigel, Oklahoma State tf. Jacob Seely, Northern Colorado, 16-0 4:18. Eric Schultz, Nebraska Dec. Tanner Orndorff, Utah Valley, 11-5. Christian Brunner, Purdue Dec. Sawyer Root, Citadel, 1-0. William Miklus, Iowa State Dec. Joshua Roetman, Navy, 6-1. Jay Aiello, Virginia Dec. Anthony McLaughlin, Air Force, 7-2. Tom Sleigh, Virginia Tech Dec. Kellan Stout, Pittsburgh, 2-1. Jake Woodley, Oklahoma Dec. Randall Diabe, Appalachian State, 4-3 TB2. Kollin Moore, Ohio State MD. Brett Perry, Buffalo, 12-3. Derek White, Oklahoma State MD. Brandon Ngati, West Virginia, 10-2. Chase Singletary, Ohio State Dec. David Jensen, Nebraska, 3-0. Matt Stencel, Central Michigan Dec. Haydn Maley, Stanford, 5-2. Demetrius Thomas, Pittsburgh Dec. Gannon Gremmel, Iowa State, 11-7. Sam Stoll, Iowa Dec. Mason Parris, Michigan, 8-5. Conan Jennings, Northwest Dec. Cory Gilliland-Daniel, North Carolina, 7-2. Zach Elam, Missouri Dec. Matt Voss, George Mason, 3-1 SV. Jordan Wood, Lehigh Dec. Colton McKiernan (SIU Edwardsville, 6-4. Gable Steveson, Minnesota for Zack Parker, Ohio, 18-3 3:22. Brian Andrews, Wyoming Dec. AJ Nevills, Fresno State, 9-2. Thomas Haines, Lock Haven et al. Billy Miller, Virginia Tech, 13-4. Amar Dhesi, Oregon State et al., Cary Miller, Appalachian State, 18-6. 125 : Trey Chalifoux, Army Dec. Willy Girard, Bloomsburg, 6-4. 157 : Ben Second Ron, Table Pin Alexander Klucker, Lock Haven, 4:39. 165 : Joseph Smith, Oklahoma State Dec. Tyler Morland, N orthwestern, 10-5. 174 : Devin Kane, North Carolina Pin. Jake Covaciu, Indiana, 4:32. 184 : Bob Coleman, Oregon State md. Chris Kober, Campbell, 9-0. 197 : Ethan Laird, Rider Dec. Rod Jones, Chattanooga, 4-2 SV. HWT : Brandon Ngati, West Virginia Dec. Jacob Aven, Purdue, 6-1. 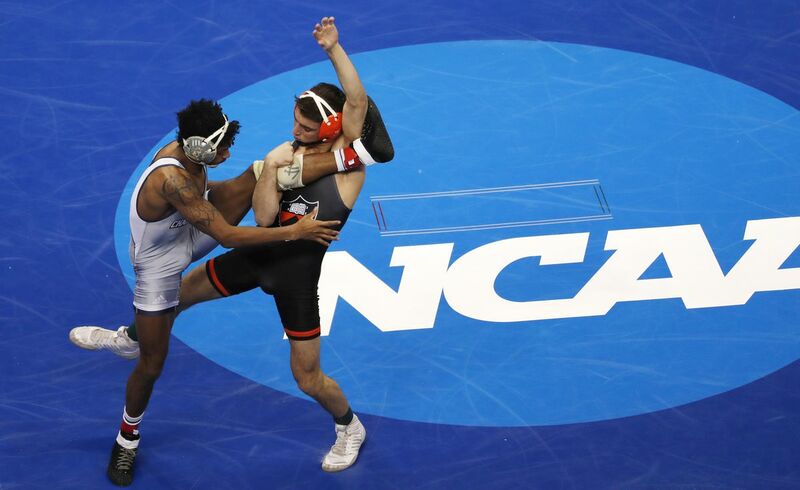 2019 The NCAA wrestling championships are opened Thursday, March 21, 2019 (03/21/2019) at the PPG Paints Arena in Pittsburgh with the first two sessions of the national tournament, including the First and Second rounds of the championship. The other four Rutgers wrestlers competing for the tournament are Peter Lipari (141), John VanBrill (157), Joe Grello (174) and Nick Gravina (184). Princeton will be represented by Pat Glory (125), Matthew Kolodzik (149), Quincy Monday (157), Travis Stefanik (174), Kevin Parker (184) and Patrick Brucki (197). Rider will be represented by Anthony Cefolo (133), Jesse Dellavecchia (165), Dean Sherry (174) and Ethan Laird (197).